I have worked in a variety of medical settings over the past 10 years starting at the retail clinic, then going into the outpatient primary care, occupational health clinic, aesthetic medicine practice, home health, private surgical practice, hospital and now academic setting. Over the past years, I have observed that some places were better than others to work at because of certain aspects. Here is my list of 9 traits of the ideal workplace for a nurse practitioner. Reputation of the facility. Whether it is a formal rating on the job search website, like Indeed, or word of mouth from a colleague about the work environment, good standing of the facility matters. As you look through the job listings and the organizational ratings of job sites, pay attention and think twice about applying with a company that rates low and has frequent negative comments by employees. Would you work for an organization that consistently ranks 1 or 3 stars out of 5 with employees citing low morale, disrespectful management that gossips about their employees on a daily basis? Or would you rather go with a company that ranks high and employee comment that while work is challenging, the environment feels like a family. Management with medical background. From my personal experience, companies that have a medical professional–either NP, PA or MD–as managers are much better places to work at then the ones that have a person without a medical background. One important thing is that such managers can consult with you about the medical aspect of patient care. They also understand your daily challenges, such the feeling of burnout from seeing increased numbers of patients, much better than those without medial training. Communication. Organizations that have open and transparent communication are great places to work. Look at the place that treats you as a real person and in which your feedback is just as important as your manager’s. I remember my first week when I started working in one practice, and they had a PR team to interview all of the team members except me. Of course, I was new and may not have had complete knowledge of the workplace practices, but acknowledgement of me as a valuable team member would have been nice. I felt undervalued and not appreciated. Needless to say, I did not stay long with that practice. Appreciation. Facilities where an NP feels appreciated feels good. There is nothing worse than feeling unappreciated. I have worked in a few places where I did not feel valued but rather treated like a robotic production component of an operation—the more patients I saw, the better. All humans want to feel valued and validated, and organizations that don’t care about their providers lose great employees. High Standards. Have you noticed that when you go out into the real world, after finishing your medical education, that the world often does not match what you learned in school? You start noticing that many facilities cut corners to cut cost, time and to increase profits and the standards of care go down. Look for a place that has outlined policies, protocols, procedures and where employees model the highest standards of care. That is why it is useful to have a shadowing day at the organization, if possible, so you can judge for yourself if this is the place where you can apply highest practical and ethical standards of care. Support. You cannot do it alone. An ideal workplace for a nurse practitioner is where she/he is supported. 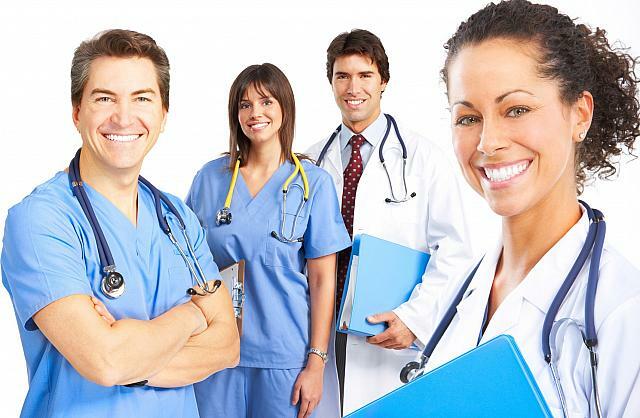 Whether it is technical or medical staff support, teamwork is very important for feeling satisfied with your workplace. Competitive pay and benefits. Good pay goes without saying because while you may take the job in the beginning, you will always be looking for a place with better pay. Also, even if you work part-time, an organization that wants to make you feel valued and keep you satisfied working for them, should offer some sort of benefits. Flexibility. Life and work balance are increasingly important, therefore, finding a place that will work with you to accommodate your schedule is another important part of finding an ideal workplace. Challenge and opportunity to grow. As medical professionals, we always want to continue developing and learning new skills. Look for a place that offers that kind of opportunity. I found that while working at the teaching hospital might not be the most lucrative place to work, learning opportunities were abundant. Having an intellectual challenge is very important in the long run to keep you stimulated and excited about your work. Luba Lee is a Board Certified Family Nurse Practitioner in Tennessee. She received her MSN from the University of Tennessee in 2006. She has a decade of clinical experience. Knowledge is power. She is passionate about sharing the most up-to-date medical information with all of her patients. As a medical writer, she strives for communication that is easy to understand for the general public, which is the key in aspiring people to live healthier, longer and more productive lives.